New Convention Space Marks Mexico’s Continued Growth As Global Meetings And Conventions Leader - Ranked #14 Worldwide In Number Of Meeting attendees it hosts. A dramatic expansion of meeting space together with the hosting of several high profile meetings has propelled Mexico forward this year with considerable growth in the meetings, incentives, conventions and events (MICE) industry. While the worst of the 2008 recession appears to be over, the capacity of governments across the globe to handle debt burdens will continue to have huge implications for future economic vitality. Countries will need to navigate in an increasingly complex and volatile international political and economic environment. 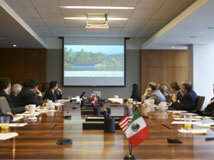 Conference sponsored by the Northeast Chapter focused on real estate Investments in Mexico’s tourism industry. The Management Committee: Eduardo Ramos-Gómez, Henry G. Burnett, James M. Cassidy, Jorge Mariscal, Alexis Rovzar, Pat Sabino, Denise Simon, and Rosemary Werrett. Alejandro Ramos, Executive Director; Paola Reyes, Trade Representative.